The NFL is a statement league in so many ways. From tattoos, to touchdown celebrations, to extreme hair styles, the NFL has it all when it comes to making a style statement. Despite wearing helmets, NFL players have always managed to have their hair become a part of their personal story, but not always in a good way. These athletes with bad hair will go down in history as the football players who took to the gridiron with some of the worst hairstyles in all of sports. 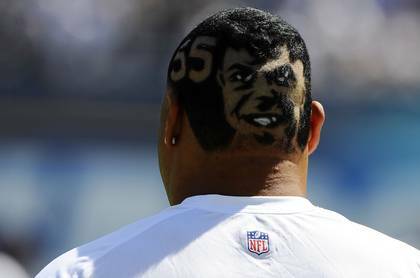 From Johnny Unitas and his legendary buzz cut, to Tom Brady’s Bieber haircut, and the Pacific Islanders in the league today who wear their extremely thick and long hair with pride, bad hairstyles have carved out a place in the history of the NFL. Like with any sport, there are some players with great hair and some players who were not so blessed. And then there is always that the group of players who have great hair, but chose to make some very questionable decisions with it, whether turning to dyes, horrible designs, or ragged looks. The number of awful hairstyles to choose from throughout the history of the National Football League is actually quite remarkable and most of these unfortunate styles cannot be hidden by simply wearing a helmet. While hair might tell a story for some of the players, it doesn’t always work out, and the results are often the worst hairstyles in all of professional football. By all accounts, Lucas Nix had worn his hair in a respectable manner until he made it to the NFL. Upon joining the Oakland Raiders, Nix was greeted with one of the traditional rookie hazing traditionss. The beefy offensive lineman had the top (and a few other random patches) of his head shaved. The result was memorable, and truly awful. Putting Fui Vakapuna’s hairstyle into words is a daunting task, so feel free to stare at this beauty as long as necessary and try to come up with the best explanation for what exactly he has going on above the shoulders. Tim Tebow’s rookie hazing resulted in this fabulous hair cut, courtesy of his teammates in Denver. They left the beard on Tebow’s face, but shaved the entire top of his head, leaving a halo of hair around the outside. No matter how offensive lineman Pat McQuistan chose to wear his hair, it’s likely that he would have made this list. NFL rookie hazing made a serious impact and the result is what can be seen above. Pretty! Garo Yepremian was a Pro Bowl kicker for the Miami Dolphins during the 1970s. Not only was Yepremian equipped with a great name, he also had one of the most interesting looks in NFL history. Mark Davis was never an NFL player but he is the son of the late, legendary owner of the Raiders, Al Davis and current owner and managing partner of the franchise. His light ginger hair makes it look like he sleeps in a Raiders helmet. Freddie Mitchell was a star wide receiver at UCLA and had a decent, but mostly pedestrian NFL career. While he was never a star in the NFL, Mitchell still found a way to get into the spotlight. He was most well known for his wild personality and his outlandish hairstyles. Preston Parker decided to go with multiple thick braids that stick straight out of his dome. It’s unclear whether or not he ever wore this hairstyle under his helmet in a game, but if he did, it would be nice to know how he got all that to fit underneath a tight helmet. Antonio Garay has had a number of crazy haircuts, which are usually paired with his facial hair to form an interesting look encompassing his entire head. He usually adds some color to all the crazy designs becauseshaving the face of another man into the back of his head just isn’t enough. Dion Jordan was the number three pick in the 2013 NFL Draft because of his potential as a pass rusher. However, his development hasn’t happened as quickly as the Miami Dolphins were hoping it would. Perhaps all the dye on his head is keeping his brain from operating at the level necessary to succeed in the NFL? 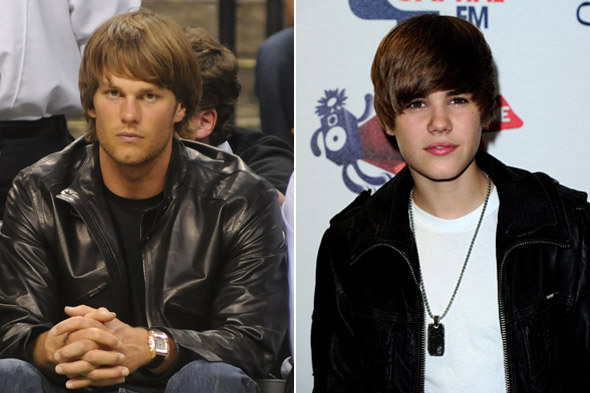 Tom Brady is an icon who is never short on style. He has a great head of hair but he has chosen a few styles that were definitely questionable. Never was that more true than when he rocked this Bieber cut. Seehow similar they are?! Tiquan Underwood rocked the super-high fade with the New England Patriots logo shaved into the back of his head in honor of the team’s Super Bowl XLVI appearance. The problem with this cool, yet outlandish look, was that Underwood was oddly released from the team just hours before the game was played. Maybe he had too much team spirit? Aside from his NFL Hall of Fame career and successful career as a sports commentator, Terry Bradshaw is known for his loud mouth… and his hair, which hasn’t changed since his days a player in the 1970s. Even then, he had the bald on top, cul-de-sac look that he still wears today. “Big Ben” Roethlisberger has never been known for his style, but this slicked-back look, complete with a wavy mullet probably tops the chart. Roethlisberger would be better off keeping his hair tightly cropped. Brian Bosworth was one of the most hyped players to ever enter the NFL. He was known for his loud mouth and even louder style coming out of the University of Oklahoma. But of all the things he was known for, his hair (which, as you can see, is quite something) was probably the most notable.